I’ll admit it: I’m very conflicted on the topic of privacy. On the one hand, I’m offended by companies such as Google, Facebook, LinkedIn and other web companies that rely on our data to turn a profit and constantly push the bounds of our trust. I’m really offended by the NSA’s apparent decision that it operates beyond the reach of any law. On the the other hand, maybe everyone should just tone the moral outrage down a bit. After all, we’re the cheapskates who can’t bear the thought of actually paying for web services and freely give our data in exchange. And besides, the chances that any human being inside Google, Facebook, the NSA or anywhere else actually knows your name without good reason is slim to none. This weekend I’m going to try to suss out my thoughts in the point-counterpoint style. Today I’ll lay out the reasons why I think we should be worried about the state of affairs when it comes to the mountains of digital data we’re producing and sharing. Tomorrow I’ll explain why we should just chill out. Somewhere in the middle, I hope I make some sense. There’s a popular (borderline cliche, really) saying among privacy advocates that when the product is free, users are the the product. As much as I loathe the saying, though, it has never been truer. Everything we do is collected and analyzed by someone, and it’s all in the name of putting advertisers in front of us. We are the product that advertisers are buying; the more they know before paying, the happier they are. 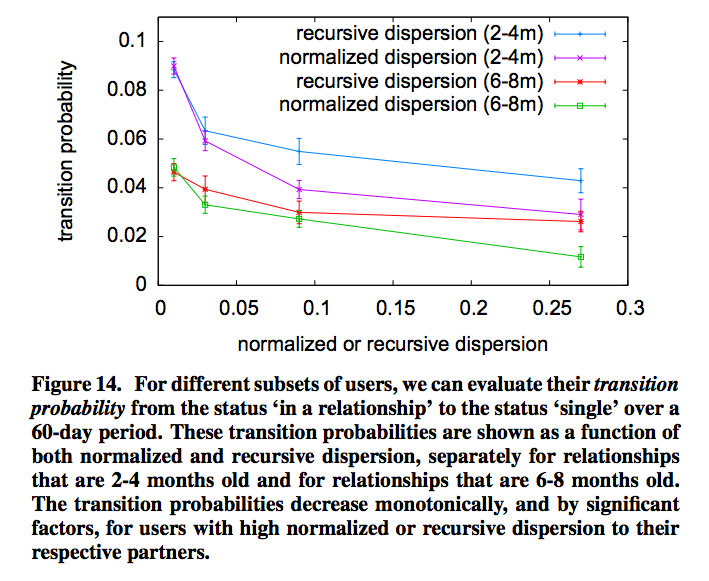 A prime example made the media rounds earlier this week, regarding a Facebook research paper detailing how it’s is able to predict fairly accurately whether or not users in relationships with each other are going to stay together. As much as I admire the data science behind this research, it’s kind of offensive that Facebook would use our data to calculate such personal things. I don’t recall signing up for the service to serve as a guinea pig for sociological research — research that Facebook will ultimately use to make money. Or take social search like what Google is rolling out and Microsoft already does via a Facebook partnership. All of a sudden, the information you thought you were sharing on a social network is now part of someone else’s day-to-day search experience. Or take the new LinkedIn’s new Intro app for iOS. From the Facebook paper: Our breakups turned into functions. This slow, steady expansion of how companies use our data is what really bothers me. It seems not so different from how an emotionally abusive boyfriend or a pimp might take advantage of someone to further their own needs. First we get hooked on the free service because it’s useful, and before we know it all our photos and contacts are there and getting them out would just be a pain. In the end, every new product is really about collecting more data of a different type. Facebook wants the intent data search can provide, Google and Microsoft want a social graph, LinkedIn wants to know who you know outside of LinkedIn, Yahoo wants — well, it wants something (maybe our photos). The products might actually be downright useful (I use the heck out of some of them), but in the end the companies just want to know more about what we do, where we go and who we know so they can paint a clearer picture of us to sell more ads. Then there are the labyrinth of privacy settings, terms of service and privacy policies that make it nigh impossible to actually manage how services use our data or to understand what they might do with it. Not that it would matter anyhow, because even if everything was crystal clear, users only have so much control. Sure, we can manage what other people see, but the company’s rights are all take-it-or-leave it terms. We all know we’re not in any position to leave it. And, frankly, understanding the full scope of what data is collected and how it’s used is so complicated at this point that many users would probably agree to anything to save themselves the time of trying to make sense of it all. And what about the NSA, you ask? What is there to say? Our government apparently wants nothing more than to spy on every living human on the planet, and it has found an ideal avenue thanks to the digitization of our communications. Constitutional law hasn’t kept up with technological innovation, and the NSA is taking full advantage of it to grab whatever it can without a search warrant or sometimes so much as even asking the company holding the data to hand it over. Some of its activities appear to break the law, until you realize that the agency is as close to being above the law as is possible and no one really has the guts to change that. The tie that binds all this data collection, analysis and profiteering is that there’s precious little we can really expect to change any of it. Maybe because we don’t really want it to. It’s the fact that these services are free that make them so great. In many cases it’s their extensive data collection that also makes them so useful. And if you think Gmail and Skype and web search are great, just wait until we have connected homes and self-driving cars. Companies like Google and Facebook — and litany of other web and mobile apps they’ve spawned — really are changing the ways in which we learn, communicate, consume and generally experience our world. In some cases — especially in Google’s case — they’re doing a whole lot more. That’s also what makes them so desirable to a rogue government agency that no one really seems to have the guts to control. For most consumers — myself included — there’s really no turning back. We’ve already given our service providers so many inches we’re approaching a mile. What’s one more? We might not like the thoughts of strangers seeing our personal details, companies betting on whether someone will break our hearts or federal agents reading our email, but unless we’re willing to lose all those Facebook photos or go back to encyclopedias and snail mail we don’t really have a choice. Feature image courtesy of Shutterstock user Juergen Faelchle. I would say that you’ve given yourself a narrow set of “similar” options. Is this intentional or did you not realize that there are other options available? Seems very narrow minded to me. But, after all, it is an op-ed piece that border lines on propaganda. Truth is that we ALL very well have the power to change these trends. Based on my college technology ethics class, plenty of younger people disagree with your conclusions. You do realize that your mindset is certainly not helping promote the cause of freedom unless you’re trying to use reverse psychology. Thanks for the comment — and you’re right that I provided a narrow set of options. I did it (a) because I was making an extreme argument about the current state of privacy and (b) because given the current state of affairs, I don’t think most people actually have too many options. Absent some really smart legislators and regulators who really know and care about these issues, or mainstream America getting a lot more tech savvy and being willing to give up Facebook, Pinterest, etc., we are kind of in a position to use what we’re given or not use anything at all. Er…Freedom? What is that? The moment you sign up for a bank account, credit card, passport (let alone ‘big bother’ ideas) and many other things you lose freedom . Today’s society isn’t able to give anyone freedom, only the illusion of freedom. We can ALL do anything to change something BUT ONLY IF WE ALL DO IT. And that won’t happen because there are too many differing opinions…and in many countries you can’t have an opinion especially if you are an alien. The mindet that you refer to are just laying out the facts. If you want to be free find a jungle to live but even then you’ll find some tax dept after you! Only joking but I’m sure you get my point. Privacy and protection of data in the cloud will be driven by business, due to their need to meet data governance requirement around sensitive and regulated data. The consumer will benefit from this, as the consumerization of IT has brought us into BYOD which drags us into BYOS. Proof that business-consumer are bringing their own services to the work environment is Dropbox, which claims over 95% penetration in Fortune 2000 corporations. So in this new era of business-consumer choice, where corporate and personal data is co-mingled, corporations must find ways to segregated and protect their data. But they must provide incentives and training for their employees to do so. A new security model is also needed, one the is not IT centric, but People Centric Security(PCS). This means the responsibility for protecting corporate data must be pushed down and delegated to the employee. As part of the process of training the employee to protect sensitive corporate information such as financial information corporations will be incentivizing employees to protect their own financial information, to assure consistent, continuous compliance. I have described the my motivation and the business model of a company I founded called nCrypted Cloud, which provides a virtual security layer above cloud storage providers such as Dropbox. But most importantly, our policies are driven by end users, and our freemium model allows users to protect their personal privacy for free, forever, but corporation have to pay their protection, hence subsidizing the end users. This is the model that I believe will scale. Corporation will pay and push for individual privacy, to meet their data governance and regulatory compliance requirements. I encourage everyone to start protecting their privacy today by going to wwww.ncryptedcloud.com. I’m not sure that the current situation should be extrapolated indefinitely into the future. If the effectiveness of online advertising (i.e. the increase in value of the products that WOULD NOT HAVE OCCURRED WITHOUT the targeted individual seeing related online ads) is low and falling (and there’s already a case to be made for this), then the current batch of privacy-invading Internet giants are committing themselves to an unsustainable business model. The way Amazon collects and uses our data, for instance, is probably better reflective of what we will be faced with in the long term, than Facebook’s approach is. you are assuming that interesting web services have to be run by profit making companies. other possibilities exist. the internet was actually really really cool before profit making companies took over. governments, universities, and companies could host social networks, search engines, messaging, email and other platforms. in much the way they did before the first dot-com boom. and they could offer these services free of charge to citizens, students employees, etc. individuals could also host there own blogs and use social networks that primarily rely on a peer2peer architecture. all of this could be done without have to charge monthly fees or advertise. the big difference is that no one gets to become a billionaire(or even stinking rich millionaire) from any of it if done this way, on the other hand that’s not everyone goal in life. anyways. i know this sounds off topic, but the reality is that the primary justification for companies such as google invading our privacy is to make the advertisers happy. I agree to a point, but I don’t think everyday consumers are anywhere near willing to embrace the model you suggest. Most have lives far removed from the inner workings of the web, and they just want services that work for them without effort. Which is why there’ll be a two-tier web. Those who know how to safeguard their privacy, give up Facebook, Google+ etc. and use distributed services with free and opensource software (diaspora, friendica, buddycloud, owncloud, xmpp, etc.) hosted on their own servers or ones they trust, versus the plebs who don’t care they’re being spied upon.